As the Kennedy Space Center (KSC) continues its transformation into a multi-user spaceport, the three buildings dedicated to processing the since-retired Space Shuttle orbiters are aiming to once again host engineers busily tending to their spacecraft. However, only one of the buildings has confirmed a tenant for the new era at this time. Technically, the three buildings are collectively known as the Orbiter Processing Facility – consisting of three “high bays” and support rooms. OPF High Bay 1 and 2 were constructed in the late 1970s, connected by a 233-foot-long low bay. They were joined by OPF High Bay 3, which has a single story-office building attached. 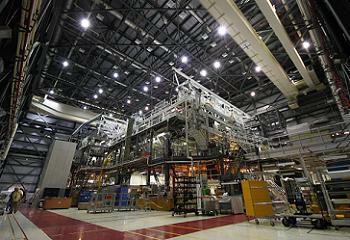 OPF-3 initially started life as the NASA Orbiter Modification and Refurbishment Facility (OMRF), before its own transition as the orbiter fleet grew in numbers. On the occasions where all four orbiters were at KSC, but outside of a mating or pad flow, one vehicle was hosted inside the Vehicle Assembly Building (VAB). 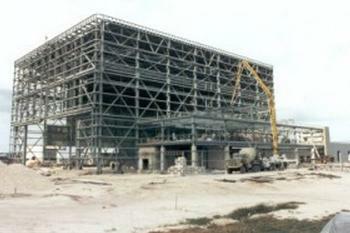 Unlike a lot of KSC’s facilities – that were constructed for the Apollo Program before being repurposed – the OPF buildings were constructed specifically for the orbiters. The open bay space inside an OPF High Bay consists of 30,000 square feet of clear floor area with a clear height of nearly 100 feet. The buildings are made from pre-insulated metal siding on a structural steel frame and features specialized heavy electrical and environmental control systems that protected the orbiters during processing. 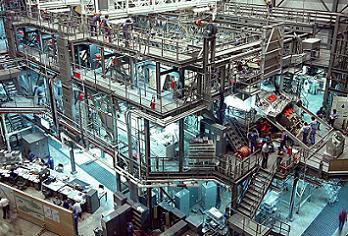 The buildings had everything an orbiter needed for her processing flow, ranging from 30-ton bridge cranes, two rolling bridges, communications rooms, offices and supervisory control rooms and a huge array of platforms surrounding the vehicle to allow engineers and technicians to access all areas of the orbiter. 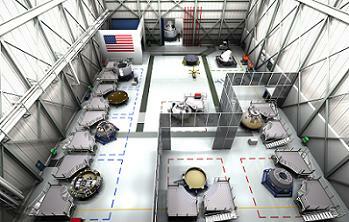 OPF High Bay 3 is already deep into its transition, following the October, 2011 deal for a 15 year lease, agreed between NASA and Space Florida – the State’s aerospace economic development agency. This agreement allowed Space Florida to lease OPF-3 to the Boeing Company to manufacture and test the company’s Crew Space Transportation (CST-100) spacecraft, creating up to 550 jobs along the Space Coast. In addition to the October announcement, Boeing announced it would be locating its Commercial Crew Program headquarters at the world famous spaceport. It also changed call signs, from OPF-3 to the Commercial Crew and Cargo Processing Facility (C3PF), with work officially started in September, 2011 – for completion in the summer of this year. There is hope Sierra Nevada Corporation (SNC) will be the next company to move into KSC, as they continue to evaluate facilities at the spaceport for their Dream Chaser vehicle. “We’ve been in discussions with the Kennedy Space Center and Space Florida about facilities (at the spaceport),” noted Jim Voss, SNC director of advanced programs and program executive for Dream Chaser to NASASpaceFlight.com last year. A potential solution for Dream Chaser to take up residency in an OPF could mirror the Space Florida work for CST-100, the creation of a clean floor processing facility, again by removing all the structures that were designed to care for a Shuttle orbiter. The KSC team are more than aware they will need to cater to the needs of a new tenant. “We’d come up with a baseline configuration of how we’re planning to turn (the OPFs) over, and there could be some negotiations where we say we’re going to remove the hypergolic hardware and (the customer) could say no we want to use some of that,” noted Stephanie Stilson, NASA Flow Director for Orbiter Transition and Retirement to NASASpaceFlight.com’s Philip Sloss last year. SNC have understandably not released any updated information on their negotiations for a KSC-based facility, likely due to talks with NASA and potentially Space Florida. 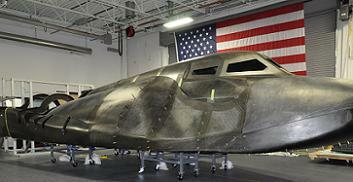 However, their recent deal with Lockheed Martin – which will see the “birth” of Dream Chaser composite airframes at the Michoud Assembly Facility (MAF) could enable the shipping of the vehicles into the KSC turn basin for the short role to an OPF for outfitting and flight processing. As previously reported, documentation has also shown that KSC management have cited preferred roles for all three OPFs to house new vehicles, namely CST-100, as already agreed, Dream Chaser in OPF-2 and the US Air Force’s X-37B in OPF-1. 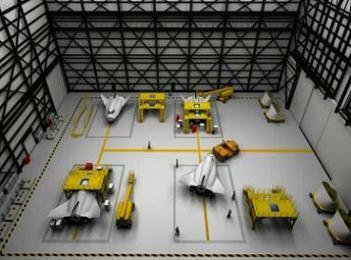 One of the obstacles for housing a military vehicle such as the X-37B in a former OPF is security. However, Ms Stilson recently claimed an OPF could provide such a role. “That could happen (military vehicle, next door to a commercial vehicle), sure. It depends on the nature of the different customers that are there. “But we could come up with ways to keep them separated, so if we needed to have a secure location in OPF-1 versus OPF-2, we could set that up so that if you are badged to go into OPF-1, you can’t go into OPF-2. 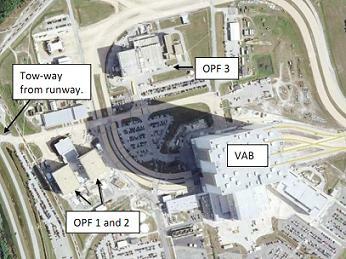 While it is expected all three OPF High Bays will have confirmed tenants by this summer, none of the vehicles will be using Launch Pads 39B or 39A. Only the Space Launch System (SLS) is scheduled to launch from Complex 39, although it may soon be joined by a newly refocused commercial launch vehicle, Liberty II. (Images: via L2’s Commercial Crew Section – containing presentations, videos, images, interactive high level updates and more, with additional image via Brian Papke, MaxQ Entertainment/NASASpaceflight.com and NASA).